The upstairs neighbor suspected of killing an 11-year-old New Jersey girl whose body was found on a rooftop in their apartment complex appeared in court Wednesday as prosecutors released grisly new details in the alleged murder. 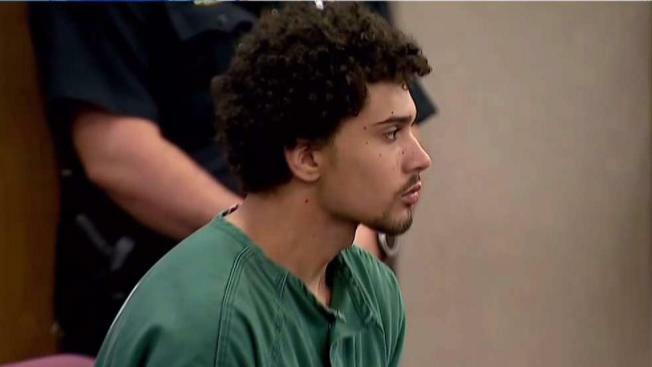 Prosecutors alleged during the detention hearing that 18-year-old Andreas Erazo admitted to killing Abbiegail Smith during a nine-hour interrogation with detectives. He didn't have a lawyer with him at the time, however. Abbiegail was taking trash out to the dumpster at her Keansburg apartment complex the evening of July 12 when she vanished. Her mother reported her missing an hour later, and police found the girl's body the next morning on a shed roof behind the suspect's apartment. The girl's body was found wrapped in a comforter and sheets, and bound with a computer cord, prosecutors said. She had trauma to both sides of her neck from stab wounds. Authorities have arrested a neighbor in the killing of a New Jersey girl whose body was found near her home Thursday morning, hours after she was reported missing by her mother, the Monmouth County prosecutor says. Brian Thompson reports. Most of Abbiegail's clothes had been taken off, but it's still not clear if there was any sexual assault. There were blood stains found on the windowsill of Erazo's windowsill and a knife was found in his apartment, prosecutors alleged. He was arrested within 48 hours after Abbiegail went missing. Prosecutors say Erazo had been put on juvenile probation nine days before his 18th birthday in December for illegal possession of a weapon, a knife. But he had no adult criminal record. Abbiegail was laid to rest on Monday.